My previous blogpost was about the Self Service Password Reset (SSPR). A nice feature for cloud identities, but this doesn’t work if you have synchronized identities or federated identities. These are managed in your on-premises Active Directory, so for SSPR to work you need to implement a password writeback solution. Luckily this feature is available, but the standard Office 365 licenses do not include password writeback functionality. You this you need an Azure AD Premium P1 or Azure AD Premium P2 license. Enterprise Mobility + Security (EMS) E3 does include Azure AD Premium P1, EMS E5 does include Azure AD Premium P2. To implement password writeback, you need to have SSPR up-and-running. To configure password writeback you have to run the Azure AD Connect wizard. Note. 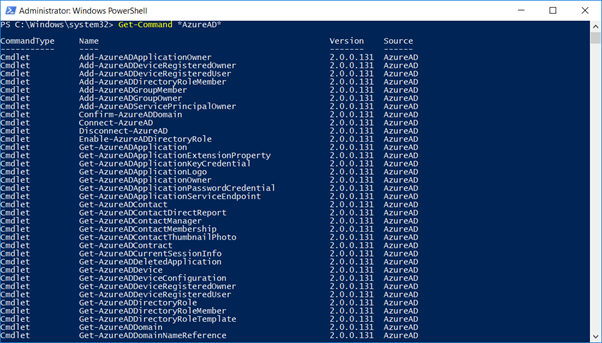 Make sure you always have the latest version of Azure AD Connect running. Even better, use the auto update feature of Azure AD Connect to make sure you’re up-to-date. 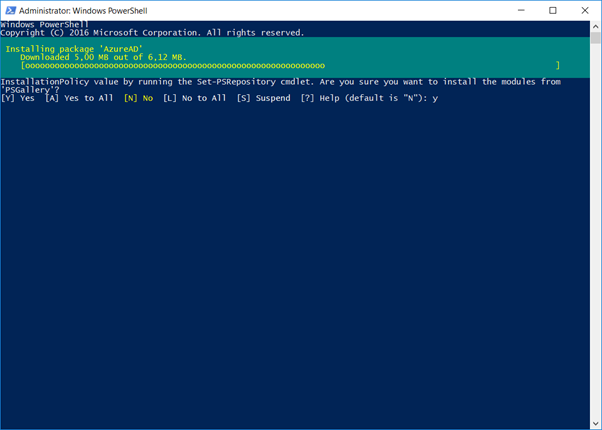 At the time of writing the latest version of Azure AD Connect was 1.1.882.0 (as of Sept. 8, 2018). Start the Azure AD Connect wizard and select the Customize Synchronization Options. Follow the wizard until you reach the Optional Features. Check the Password Writeback option as shown in the screenshot below and click Next to continue. Follow the wizard until the configuration is complete and click Exit to finish the wizard and store the new configuration. The service account that’s used by Azure AD Connect needs the appropriate permissions in your on-premises Active Directory to store the new password that has been set in Azure AD. Open Active Directory and Computers, enable Advanced Features, select the properties of the domain, click on Security, click on Advanced and click Add. Click on OK to apply the changes to Active Directory and close any following pop-up boxes. To test the password write back option, follow the same procedure as in the SSPR blogpost. After you have changed your password, it is written back to your on-premises Active Directory and the following event is written to the eventlog of the Azure AD Connect server. In this blogpost I’ve shown you how to implement password writeback in your synchronized Azure AD environment. One prerequisite is that you need to have Self Service Password Reset implemented, and you need to have an Azure AD Premium P1 or Azure AD Premium P2. 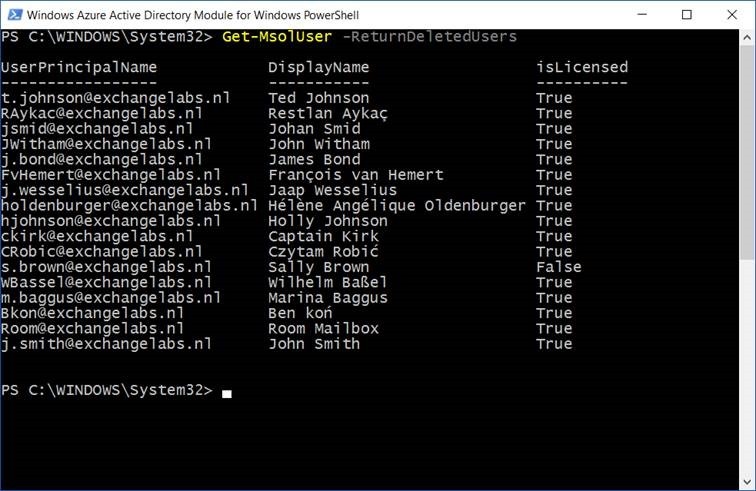 When you delete user accounts from Office 365 (en thus Azure Active Directory) these accounts are not permanently deleted, but they are kept in a Deleted Users container for 30 days. This is not only true for cloud users that are deleted in the Microsoft Online Portal, but also for synced users that are deleted in your on-premises Active Directory. 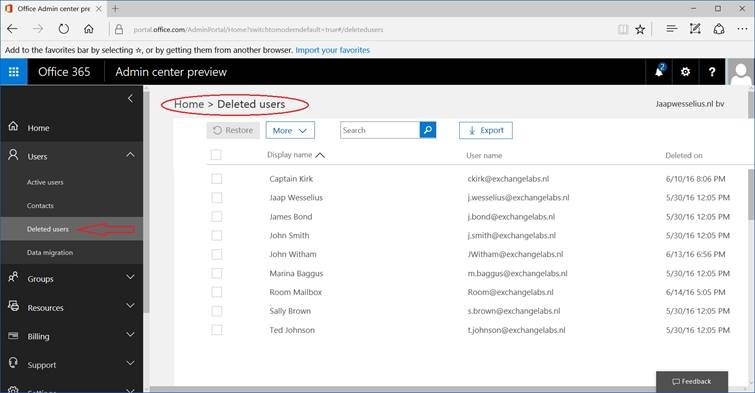 Although you can see the deleted users in the Microsoft Online Portal, there’s no way to permanently delete them here. 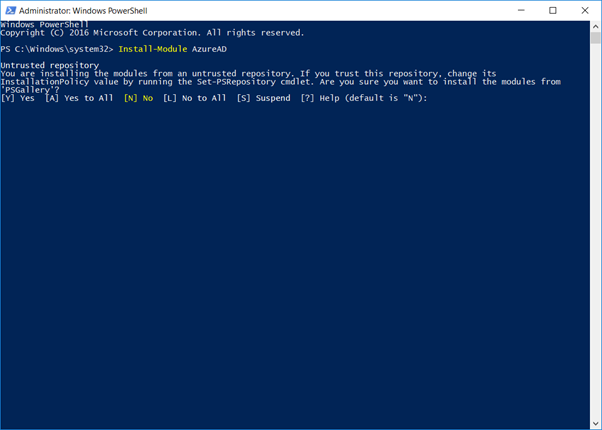 The solution is to use the Azure Active Directory Module for PowerShell, using PowerShell you can actually permanently delete these user account. 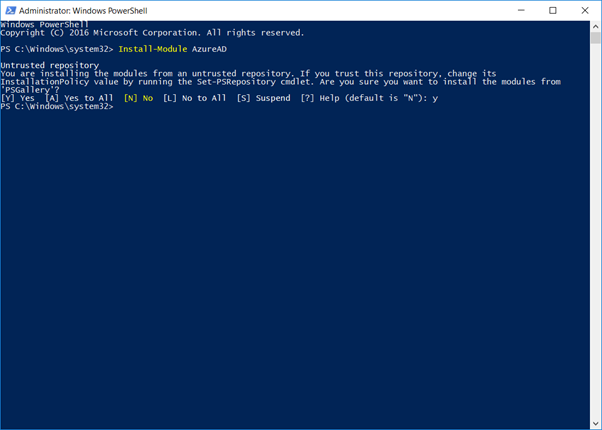 To permanently remove these user accounts you can use the same command, but pipe the output of the command into the Remove-MsolUser -RemoveFromReclycleBin command. You can add the -Force option to bypass the confirmation of each user deletion (i.e. the ‘Are you sure? Yes[y], No[n]’ message). Now when you execute the Get-MsolUser -ReturnDeletedUsers command you’ll see the all users are permanently removed. Please be careful, once permanently removed there’s no way to restore the user accounts!